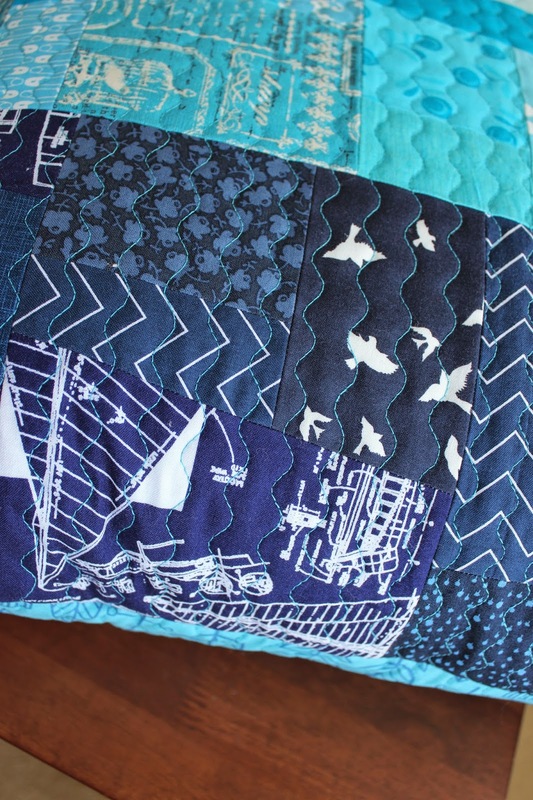 This project was inspired by my overflowing blue scrap bin. I divided the scraps into three groups, by value. I love monochromatic strata (aka crazy piecing or slabs), and a color progression of strata is even better! I quilted the 22 inch improv panel with an elongated serpentine stitch on my sewing machine. I created an envelope closure, but this time I quilted the back of the pillow as well. I bound the edges with single fold binding, machine stitched. This construction makes for a really sturdy pillow. I was able to overstuff the pillow as a result. Who knew 22 inches isn't a common size for pillows? Lucky for me, a squishy 24 inch pillow form works perfectly. 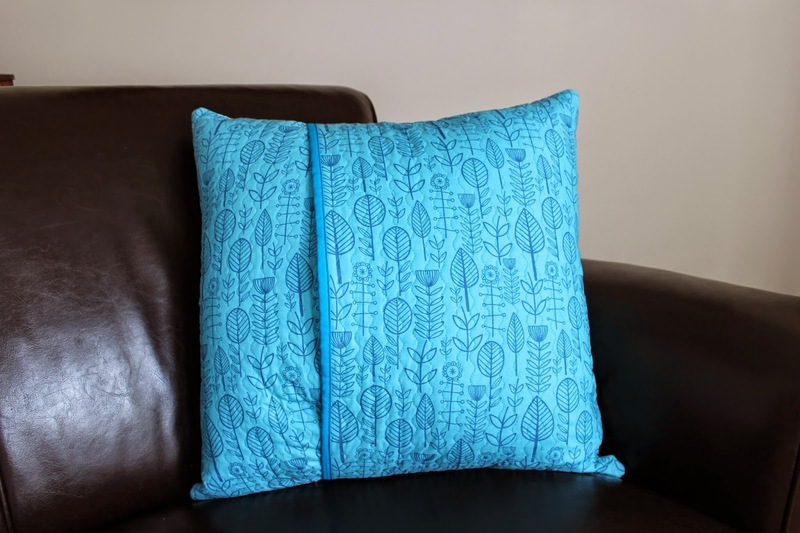 I think a simple lined back would gape open under the pressure, but this fully quilted pillow holds the form beautifully. 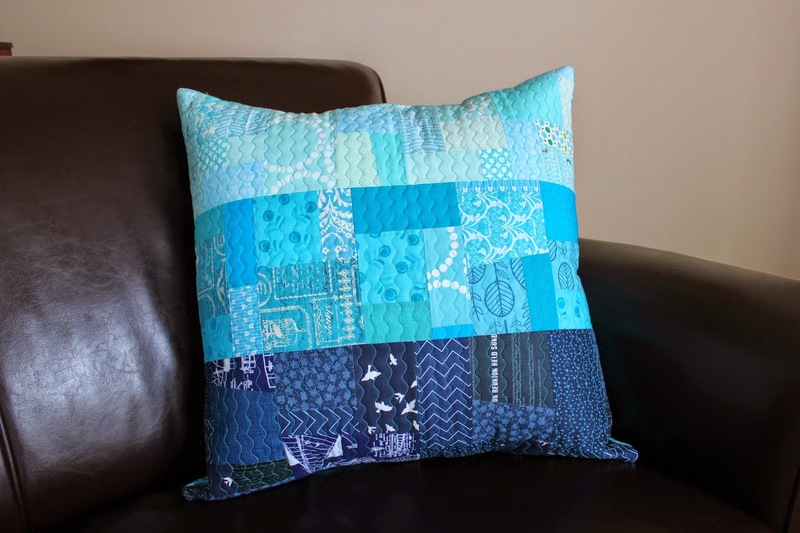 You can find this quilted pillow cover in my etsy shop. sold. 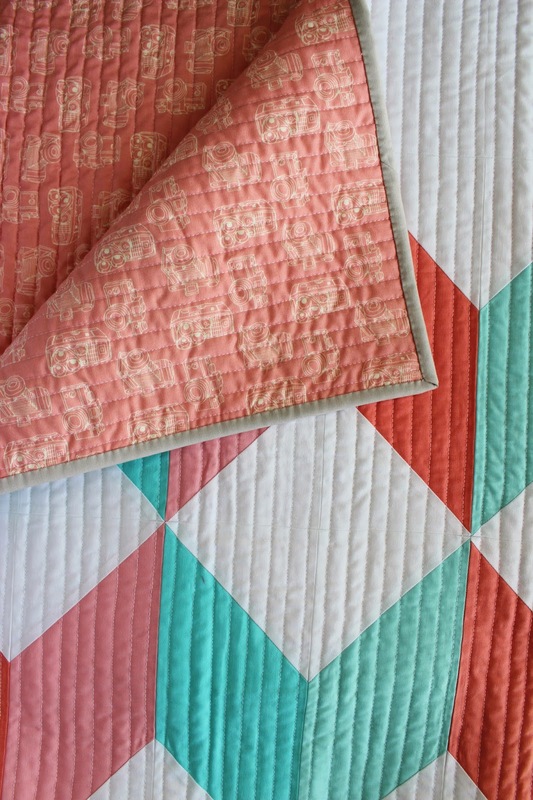 Shades of coral and aqua were the starting point for this spring baby quilt. I also wanted to play with the traditional tumbling blocks pattern. 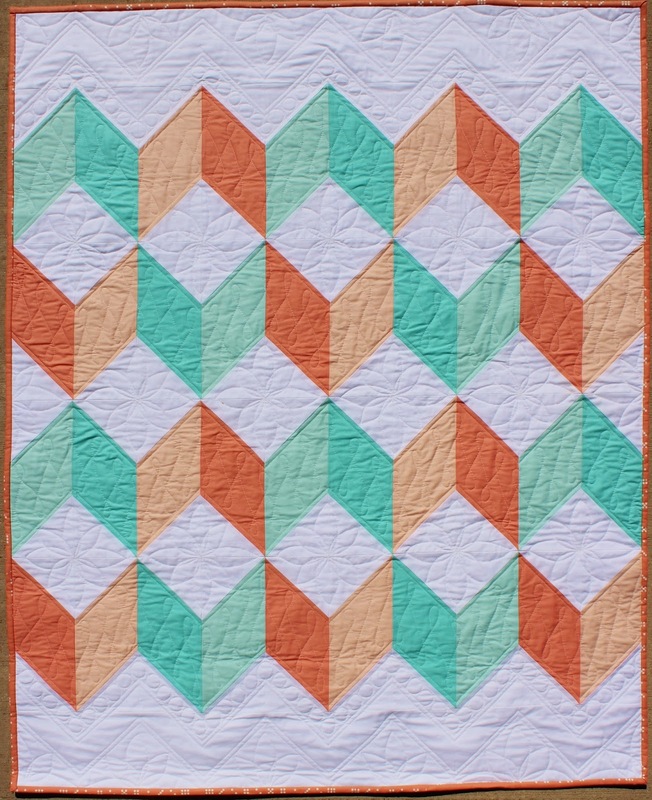 My stitch and flip version eliminates y seams and templates in favor of easy to cut squares and rectangles. 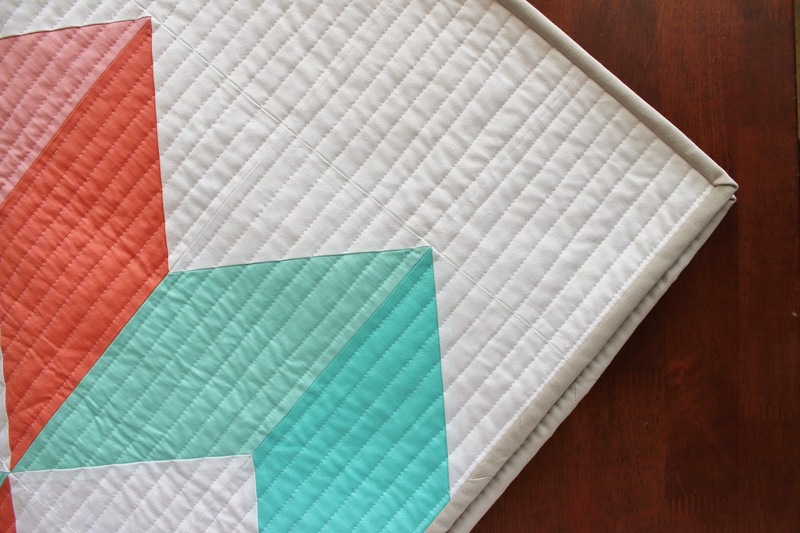 The use of solids and straight line quilting make it clean and modern. Create depth with careful use of value and placement of colors, much like what was traditionally done in the tumbling blocks pattern. 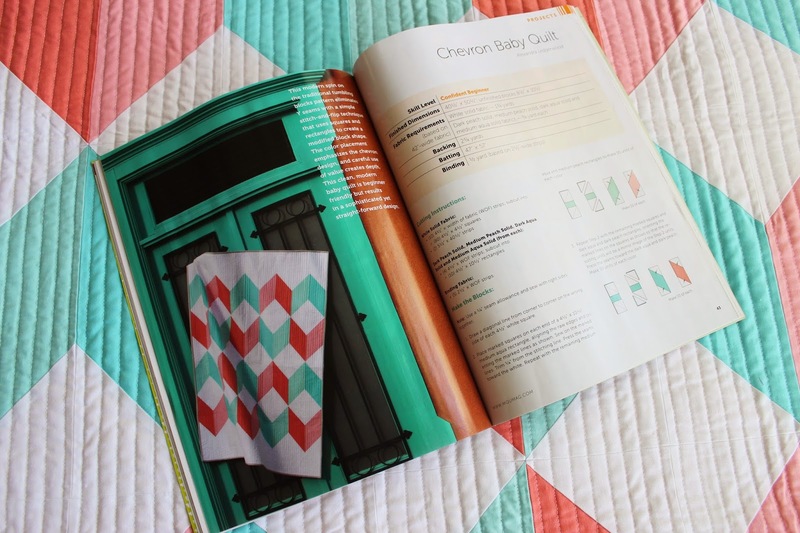 I bound the quilt with a pale gray and backed it with a cute camera print. 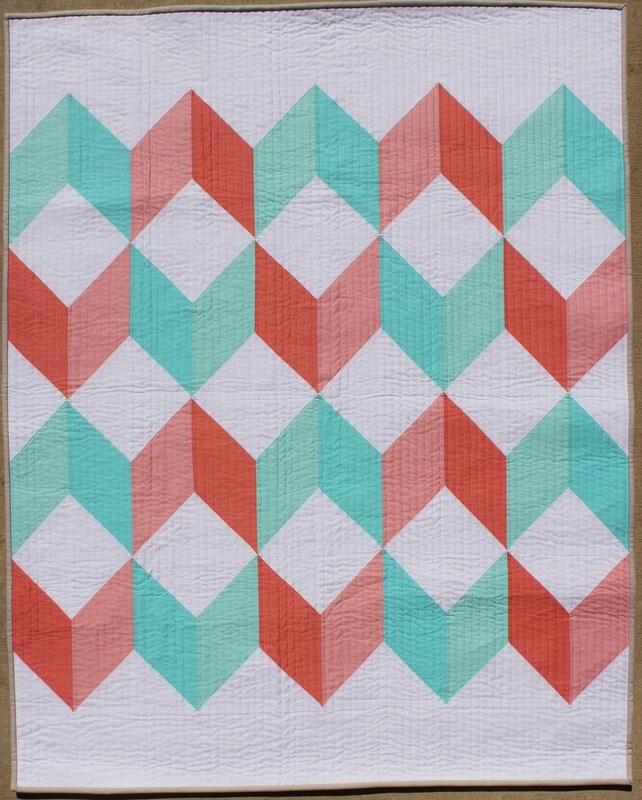 You can find the pattern for this 40" x 50" quilt in the Spring 2014 issue of Modern Quilts Unlimited. Single issues can be purchased here or found at your local craft store newsstand. 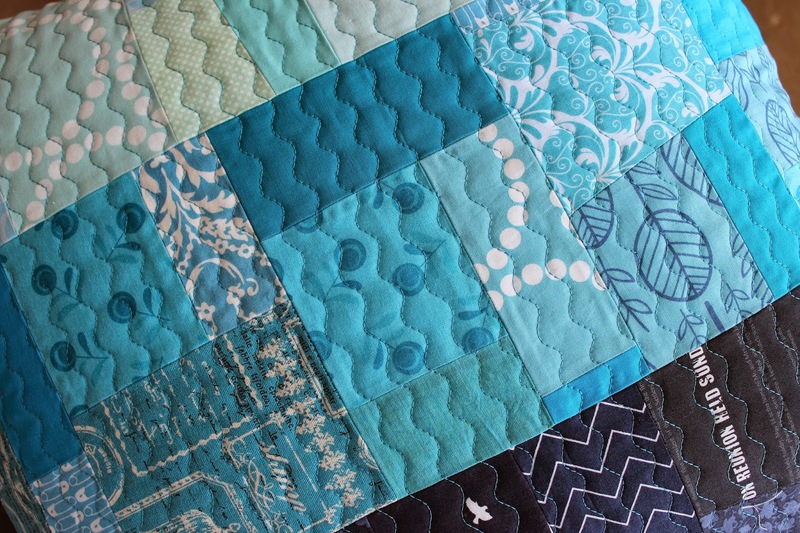 The test version I made of the quilt provides an interesting contrast to the final version. 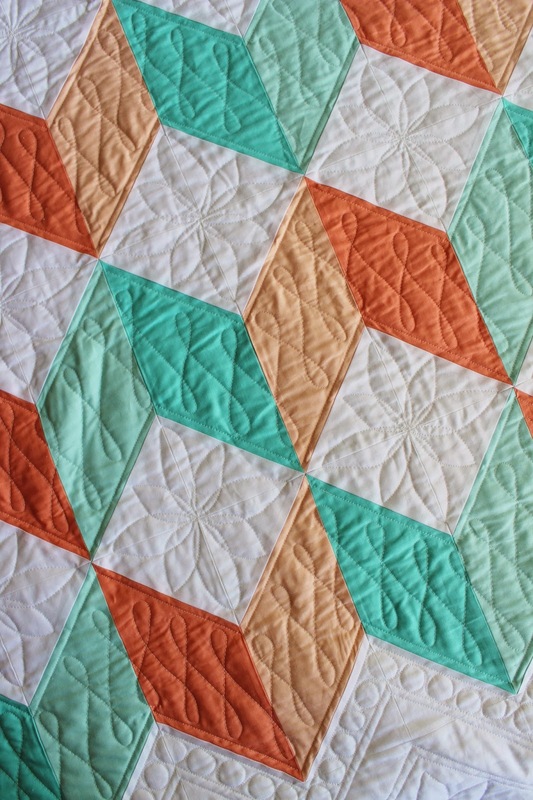 The two quilts show just what a difference quilting makes in an overall design. 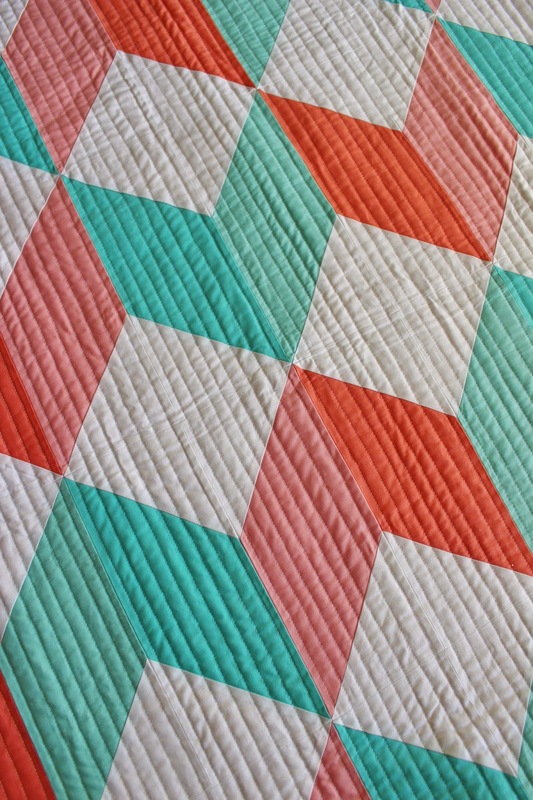 Even though the pattern of the two quilts is the same and the colors are very similar, the free motion quilting designs on the test quilt give it a much more traditional feel than the one quilted with plain, straight lines. 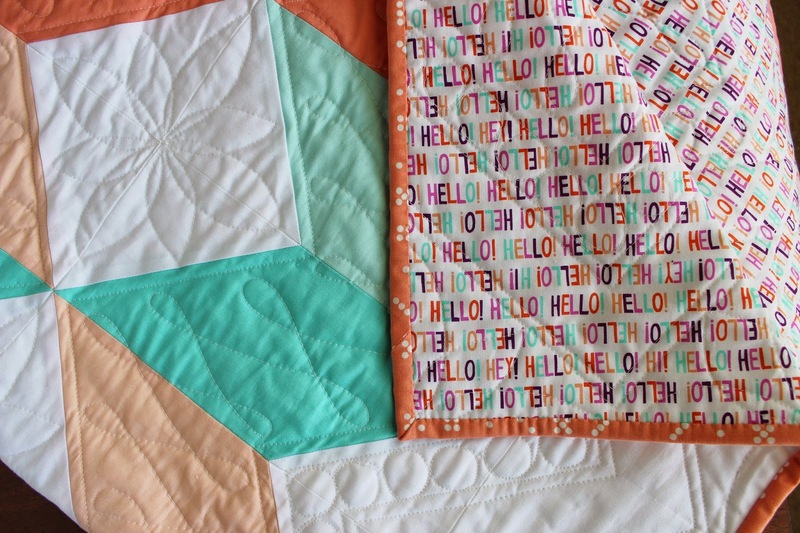 I backed this quilt with a fun, multicolor Hello print and bound it with a coral print by Violet Craft. 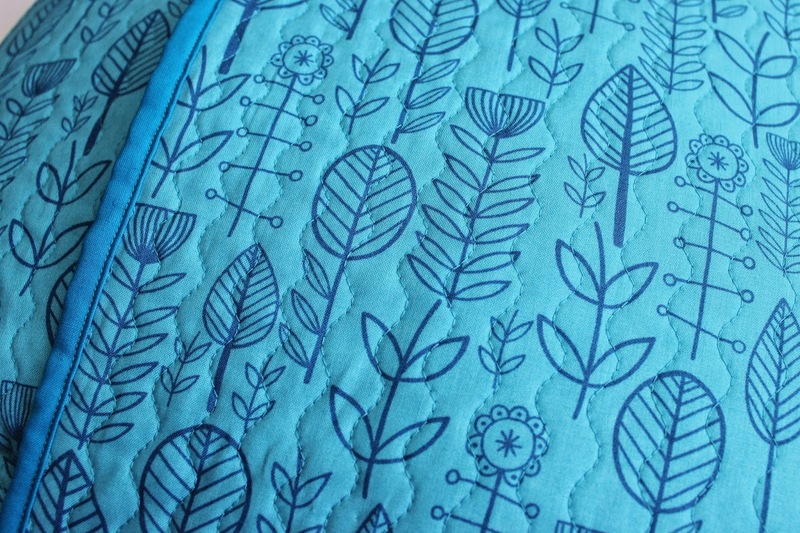 I like the whimsical touch that comes from adding prints to a mostly solids quilt. 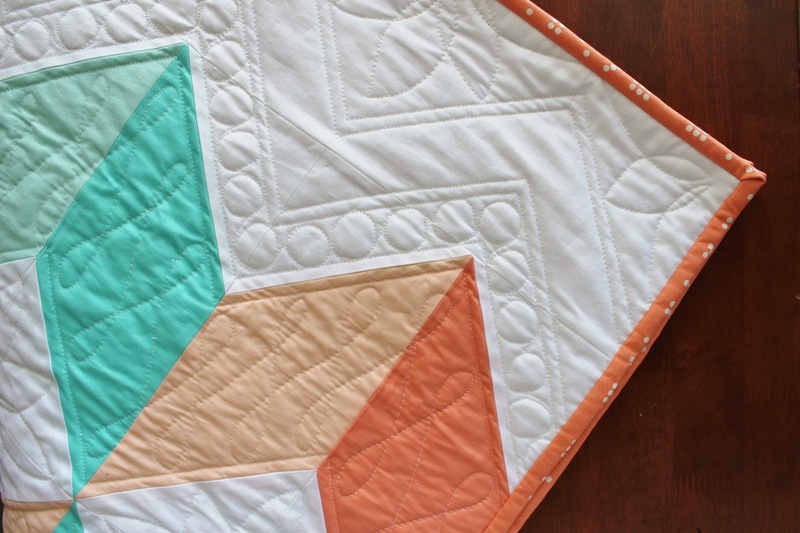 You can find this version of the Chevron Baby Quilt in my esty shop.